Tell me about your travel background. Why do you love working in travel. I have a passion for finding out about different countries and cultures. The world is a massive place and each year gets more accessible. After 8 years out of the industry my passion for travel brought me back. Canada(Niagara Falls, Montreal)Majorca, Tenerife, Portugal, Ibiza, Turkey, Kos, Corfu, Rhodes, Zante, Cuba, Mexico (City, Caribbean and Pacific Coast), Bahamas, Antigua, Tortola, Barbados, Dominican Republic, St Vincent, Dominica, Florida (Disney), Florida Keys, Gran Canaria, Cyprus, Disneyland Paris, Cozemel ,Puerto Rico, Egypt. Budapest in March, very excited. Still deciding on our summer holiday. Singapore, Dubai, Bali, and Zanzibar the list goes on and on. Favourite Holiday Place and Why? Cannot say just 1. Mexico- Love the culture in the city, the history and the beautiful beaches. 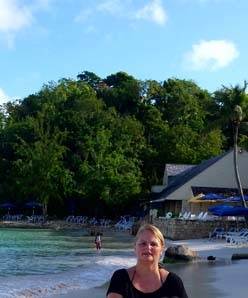 Antigua- Married there, love the people and the island, a piece of me feels at home there. Zante. Alykes- One of the friendliest places I have been, beautiful beaches, amazing scenery. Such a relaxing place with fantastic restaurant’s. Favourite holiday memory and why? Pineapple Beach Club Antigua - One of my favourite places for so many reasons, especially when we were lucky enough to be there and see turtles hatch on the beach and go into the sea. A once in a lifetime experience and memory. Always remember to pack, chargers for your phone so that you are able to take lots of photos. Adapters as well as hair dryer and straighters - don’t want to be scaring the locals! I love talking holidays! I am always happy to go the extra mile to help find you the perfect holiday. I look forward to hearing all about your trip on your return and getting to know you and helping discover your next holiday destination. Researching…Always research your destination well first, everyone likes different things so make sure it’s what you want. And most importantly enjoy it!